On August 17 of last year I reviewed the Versa-Carry holster system and gave it a big thumbs up. I loved the minimalist design which promoted an easy and comfortable way to carry a concealed handgun inside your waist band which is why I chose to photograph the Versa Carry with the Colt New Agent. This is the complete marriage between a minimalist pistol (you can't get any more minimalist than no sights) with a minimalist holster system. At that time I mentioned that they would be coming out with their Generation II model around October. Well shortly after my shoulder surgery last October a small package (good things come in small packages you know) arrived from the good people at Versa Carry. It was their new Generation II holster. Fortunately for me their holster system is completely ambidextrous since the surgery left me only able to use my left hand. The Gen II models have replaced the Gen I models and this is fine with me as the evolution from the original to its sequel would make the predecessor obsolete. One of the most noticeable refinements are the different colored barrel retention rods which delineate the different calibers for which the holsters are designed. I would imagine that quite a few owner's of the Versa Carry system purchased several different holsters for their various handguns but had a hard time telling them apart since they were all black with a white retention rod. The next enhancement is for safety and it is a rounded insert that covers the trigger guard. The photo above and below shows the trigger guard in place on a SIG P238 and a Diamondback .380 ACP. 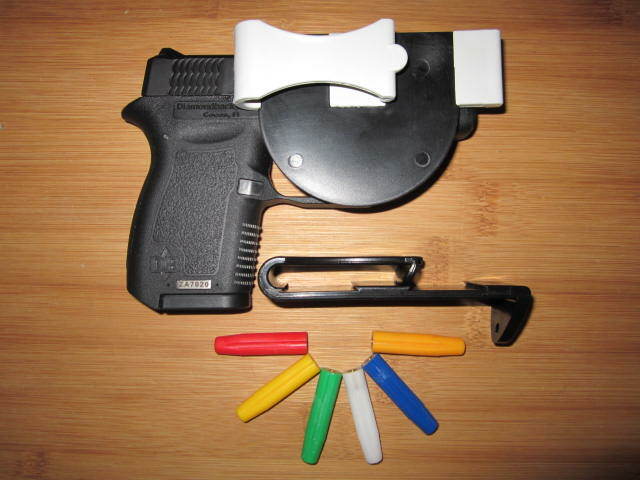 The system in that photo shows a two-tone white and black holster which is done for the purposes of highlighting how the new trigger guard interfaces with the holster. The production models are all black. The purpose of the trigger guard is to keep your finger off the trigger as you are inserting the unit into your waist band. The way to put this system on is to first put the pistol all the way into the holster so that the barrel is completely covering the retention rod and then insert the holster and pistol down, inside your waist band, slipping the clip over your belt. With the trigger guard in place you simply cannot get your finger on the trigger which will greatly prevent a negligent discharge while putting the holstered pistol in place. The use of the trigger guard is optional. 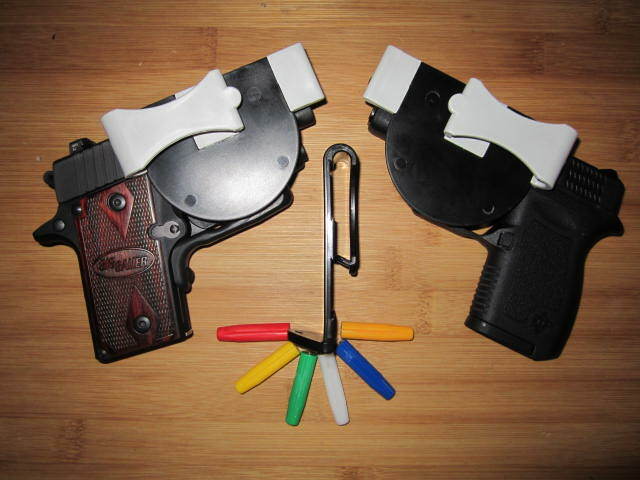 If you want to put it to use just slip it into the tight dovetail channel on the inside of the holster clip. It snaps very positively in place via a post on the inside of the dovetail channel and marries up to a corresponding notch in the trigger guard. If you don't wish to use the trigger guard the holster comes with two spacers that slip into the dovetailed channels. On of the other things I noticed about this General II model; everything is tight. The trigger guard fits tightly into the inside of the holster, the retention rod fits tighter into the barrel and the clip grips your belt very tightly. In other words your pistol is going no where until you decide to remove it from the holster. The trigger cover is a nifty enhancement. Minor addition for major safety increase. The Versa Carry is getting real close to my preferred way to carry - gun just tucked inside the waistband. Before anyone gets nervous I said that is my "preferred" way to carry. I don't actually carry a naked gun in my waistband to much liability with an exposed trigger. I'm gonna put A Versa Carry on my list. That Colt New Agent is on my list too only I want the DAO model . . . I use a Versacarry Daily in my security job. I'm constantly in and out of vehicles and haven't had one problem with looseness in SOB. Actually it is so comfortable that I forget it's back there. GREAT PRODUCT!